When I began this little study of human history I started because of a curiosity as to when Europeans first came to the Americas. The general consensus is that they came from Siberia through a land bridge, formed as the ice age lowered sea levels some 145 m, and known as Beringia. They moved into Alaska, and thence down into the lower 48. The contrasting and almost unknown alternative, was based on an initial earlier arrival of some European individuals, based on two different forms of evidence. One of these related to the tools that the Paleo-Indians were using at the time that the cooling period known as the Younger Dryas occurred. The second arose because of the considerable strides that have been made in the analysis of individual DNA, and what it tells of the ancestral lineage of an individual. In order to better understand some of the terminology of the books and articles that I have since read, it seemed that working from an example set of data might make it easier to follow the various discussions. Thus we sent away family samples from a male, me, and from a female, the Nurse, to the Genographic Project for initial analysis. The results of that initial investigation were a little perfunctory, but showed that on both the male and female line that our ancestors were likely in France and Spain at the time of the Younger Dryas, being a part of that colony that is now referred to as Cro-Magnon man, although a more refined term for the folk in that region and period may be Solutrean, of which more anon, and in later posts. In his books that tie climate change over the centuries and millennia to changes in the human condition Brian Fagan has described some of the conditions in that period between the Last Glacial Maximum and the Younger Dryas when, for a couple of thousand years, the planet warmed and the ice retreated. 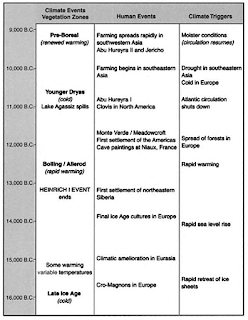 (See, for example “The Long Summer” and “Cro-Magnon Man.”) The changing climate led to human migration north out into the upper parts of Europe, while the following thousand year cold spell of the Younger Dryas, largely drove the people of the time back south, into colonies that lay below the ice sheet. Figure 1. 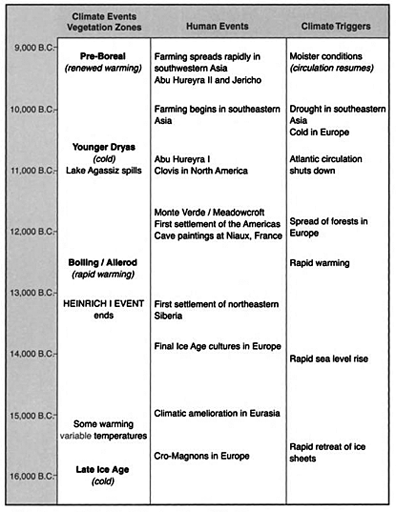 Some of the significant events in the time around the arrival of the Younger Dryas (Fagan – The Long Summer). 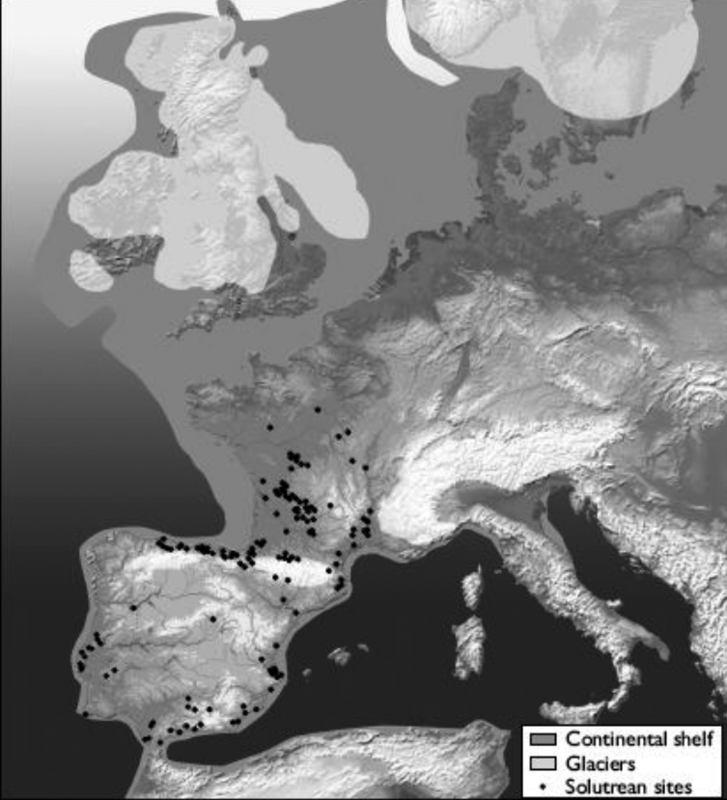 Fagan points out that at about this time the European settlement was likely only around 50,000 individuals – though there were also tribes of Neanderthal that has previously occupied the terrain. 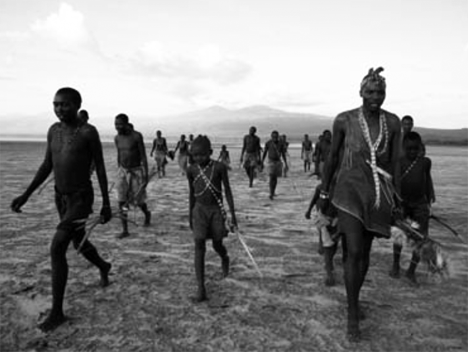 Tribes of the time were still of the hunter-gatherer type, and thus consisted of small family groups, migrating with changing conditions, and (as the example of the San bushmen of Botswana show) having and leaving few possessions to help with our archeological analysis of the period. On a measure of scale, Jacob Bronowski pointed out (in the “Ascent of Man” that the Sami or Lapp, who migrated north with the reindeer as the ice caps retreated still only number about 30,000, in a land with 3 million reindeer. They were totally dependant on the herd, and ate an average of a pound of meat a day. (The incidence of modern technology is changing their way of life, but in the summer that I spent up there in 1964 the family group I lived near, for a short time, were still small in number, and, being migratory, soon moved on with the herds). 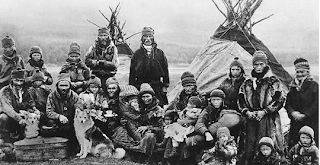 A photo from the 1900-1920 period shows a group size of 20-25 individuals. That size seems similar to the numbers in one of the hunter-gather tribes of the Hatzabe in Tanzania. More memorably in the video version of Bronowski’s work he shows a Bakhtiari family who migrate a flock of 50 sheep each year, and who, when they reach a river in flood leave an old man who cannot cross behind. These small groups of hunters 15,000 years ago used stone tools to provide the blades for their hunting weapons, and had learned to shape these to work to give the most effective result. Stone tool shapes are one of the few ways of tracing how technology changed, and the tribes that had made it into what is now the Americans had (as the above table above shows) developed a particular shape for the stone on their spears, which raises one of the two points of this post. The controversy that arises relates to the shape of some of those spear points. For while the shaped spears started in different forms, after a time it seems that one specific form, known as the Clovis point, became common across much of America and being found in with the animal bones showed that it was used to kill mastodon and other animals of the time. Typical Clovis points, like this example, have parallel to slightly convex edges which narrow to a point. This shape is produced by chipping small, parallel flakes off both sides of a stone blade. Following this, the point is thinned on both sides by the removal of flakes which leave a central groove or ‘flute’. These flutes are the principle feature of Clovis or ‘fluted’ points. They originate from the base which then has a concave outline and end about one-third along the length. The grooves produced by the removal of the flutes allow the point to be fitted to a wooden shaft of a spear. The specific feature of the “fluting”, the two grooves on either side of the point that run along the axis of the point and help retain the split ends of the pole (the haft) into which it is fitted (before being held in place with wrapped sinew or cord) are one of the major characteristics, and can be more easily identified with a sketch. Bryan Sykes has pointed out that the ripples within the flute also hold the tip within the split wooden shaft, without the need to bind it into place with sinews. 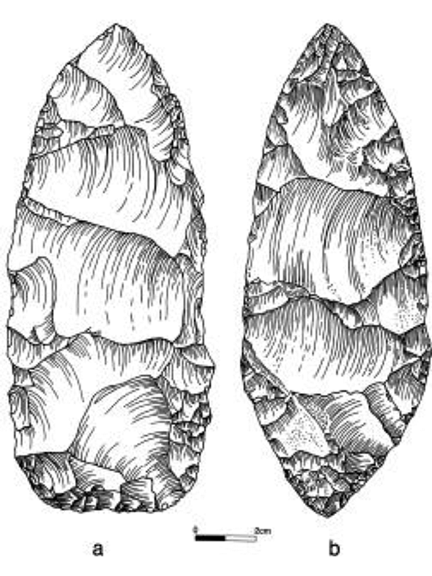 Dennis Stanford and Bruce Bradley in “Across Atlantic Ice – The Origins of America’s Clovis Culture” (S&B) however tried both fluting and not, and found little difference in their effectiveness in hafting. The people who used these hunting weapons lived at the end of the Pleistocene Era, up to the point that it transitioned into the Holocene – as the current geological interval is called. The have become known as the Paleo-Indians and their use of the tools seem to have disappeared with the onset of the Younger Dryas. A recent press release from UCSB gives evidence of a meteor strike which initiated the Younger Dryas cold period some 12,900 years ago. And this is where the first controversy appears. The Clovis points were named from the site near Clovis, NM where the shape was first identified, lying near some mammoth bones. David Meltzer’s well written book “ First Peoples in a New World: Colonizing Ice Age America,” has described the growth of additional discoveries that found that this particular shape had become common across the country. However, as more sites with this shape were found, there is some evidence, noted in Meltzer, but described more fully by Stanford and Bradley that the Clovis shape did not begin on the West coast, but that the origin, in this continent, was rather in the East. 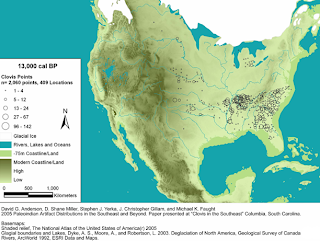 They also feel that the widespread use of the Clovis point at the beginning of the Younger Dryas means that the continent was more densely occupied than could have been achieved within the short period of time since an arrival through Beringia, without including water travel (of which more next time). Figure 6. 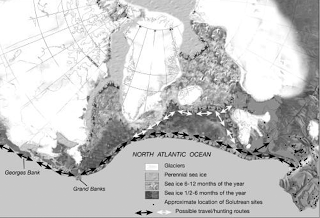 Clovis point distribution (Anderson ) (Note the two ice caps define the ice-free corridor from Beringia in the top left). At that time it is also conjectured that the population in the Americas (note the extent of the ice sheet still in Figure 6) could have grown to 600,000 people. (Meltzer (quoting Martin). However in the top left-hand of the above picture is the end of the corridor between the ice caps through which the first Native Americans were supposed to have passed to come down into the Central Plains. The problem with this route, however, as the sole passage for the peoples, is that (as Stanford and Bradley point out) several-fold. Firstly because it lies between the two ice sheets there was a slow growth of vegetation, which would slow the migration of animals, and thus people down the valley. The second is that the technology of tool use differs. 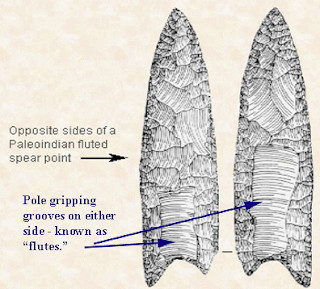 In Asia and into Beringia, the people more commonly inserted small microblades of split stone into the sides of wooden holders to make their weapons, rather than using the larger blades on the end of the spear. (This has become known as the Dyuktai Culture). And they apparently used these to hunt polar and other bears. As a result there are no Clovis points as one moves through Beringia. And the evidence also shows that the ice-free passage down into America was not used until around 12,000 years before the present (BP), while as S&B point out, Clovis technology was established in America over 13,000 BP. And thirdly there is a problem of the DNA of the folk in Beringia. (which I will come to later). 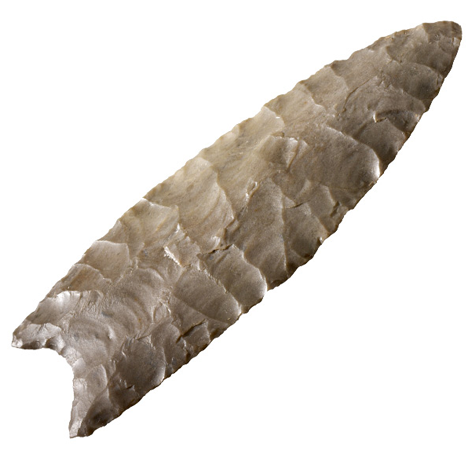 The Clovis points, it turns out, are much more similar to the weaponry that was developed in Europe, and which had been excavated first at the town of Salutre in France, where they used them to hunt horses (for food). Although that development predated the use in America the period between is being reduced, with the further discoveries of recent times, although since this was during the Last Glacier Maximum (LGM) the sea was much lower, and settlements were on plains that are now underwater. And so the archaeology is slow to be uncovered. This finding has led to the proposition that European settlers came to the Americas by sailing along the edge of the ice cap, during or towards the end of the Last Glacial Maximum. (An idea first proposed by Greenman* in 1963). Radiocarbon dating of the various sites has suggested that the “technology” migrated to the West, at the time before the Younger Dryas, a time when the mastadon, mammoth and other large animals were moving to extinction. (Some have suggested that this extinction was also caused because of the change in vegetation due to the climate change). The presence of a Solutrean laurel leaf blade at a site in Eppes Island, which has been shown to be of French origin is one of the talking points of the year. It would thus appear that there was more than one route into the Americas, and S&B suggest that, given the lack of Clovis points in Beringia and Alaska, it may have been that Clovis-carrying Paleo-Indians were there to meet the travelers down the McKenzie Valley when they finally made it. That is, however, unlikely, given the nature of the DNA evidence, which confirms, to a large degree the Asian origin of the Western First Nations. But there is an exception to this (which relates to my original enquiry). To quote Spencer Wells: in Deep Ancestry: The Landmark DNA Test. The real controversy surrounding haplogroup X is its place as one of the five haplogroups found in the indigenous peoples of Americas, where it is found exclusively in North America at varying frequencies. In the Ojibwa from the Great Lakes region it is found at around 25%, in the Sioux at around 15%, the Nuu-Chah-Nulth at more than 10% and in the Navajo at 7%. But the X2 is is almost entirely absent from Siberia, the proposed land route fo the first migrations into the New World. Unlike the four main Native American haplogroups (A,B, C and D) haplogroup X is entirely absent in East Asian populations., indicating that it played no role in colonizing those regions. However its age estimate in the Americas, around 15,ooo years old, does indicate that members of this group were among the first modern humans there. In other words the further one moves west in the United States, then the less impact that the X2 group had on providing ancestors. X2 makes up around 2% of the European mtDNA lineages and is more strongly present in the Near East, Caucusus region, and Mediterranean Europe. And I will close today with that puzzle and a thought. One of the problems with bringing together the limited evidence from sites that are widely scattered lies in the need to find a way of connecting them. This is potentially where the use of DNA comes in. For example, before the Solutrean technology was in use it had to develop – where did that happen? It turns out that there S&B note a suggestion that this occurred in the western Eurasian plain in the Crimea and along the banks of the Don in what is known as the Streletskaya. From there it may have migrated west, both to France and Spain, but also into southern Britain.(pdf). 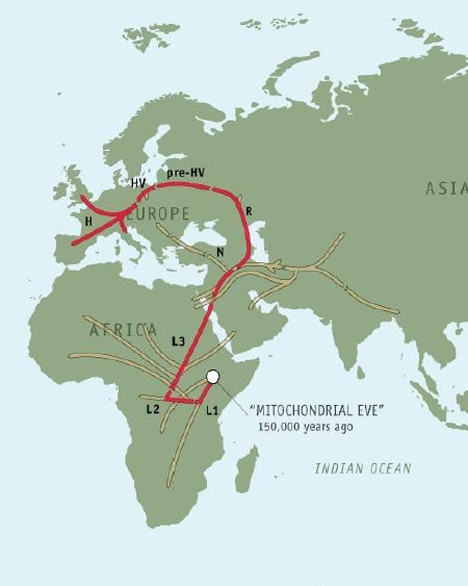 The migratory paths of my own ancestors show how that evolution might have occurred as our tribe migrated west, passing in the process through all three regions. Figure 10. Path of our female ancestors through time, showing the different spin-offs of different haplogroups along the way. (The Genographic Project). I will talk a little about boats, migrations and the next possible European arrival (the Red Paint People) in a subsequent post. There are increasing numbers of sites that discuss this topic, with various differing views on the controversy. Are you at Misfits and Heroes? I'm going to write a little more on how they might have got there in the next post, and there is yet the arrival of the Red Paint people and the Vikings to add additional layers of questions. Yes, I'm at Misfits and Heroes. From the wide range of dates for early settlements in the Americas, it seems likely there were different migration paths and points of origin. The problem with extrapolating backward from DNA is that populations that failed, for one reason or another, are not included and thus made invisible, even non-extent. Some European settlements in North America failed, sometimes with the death of every person. Nonetheless, those people existed. Ever try to maximize your free satoshi claims by using a BITCOIN FAUCET ROTATOR?